The 25.1 metre Sunseeker White Gold has been sold by Steve Handy at Sunseeker Portugal and Stephen Faraldo at Atlantic Yacht & Ship. 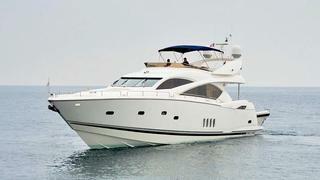 The Sunseeker 82 model is built in GRP and was launched in 2006. White Gold features a classic white hull with a sumptuous high gloss cherry interior, offering vast volumes for her size and a full beam master suite similar to that of a 30 metre vessel. White Gold is a fully loaded example of the 82 Yacht series, including a flybridge crane, upgraded generators, upgraded Raymarine displays, trim tabs, customised saloon layout with a television fitted to the bulkhead and a comfortable seating plan. She can accommodate up to eight guests in four cabins, with plenty of space for two crew members. The exterior spaces on _White Gold _include a spacious aft teak deck with an al fresco dining table and steps leading down to a hydraulic bathing platform. There is also a flybridge with more al fresco dining and seating under a Bimini top, and a large sun lounging area, plus a separate space for a tender and water sports equipment. Powered by Twin 1,675hp Caterpillar engines, White Gold has a cruising speed of 23 knots and a maximum speed of 30 knots. She has been meticulously maintained and never chartered.